Our Summer Directors retreat will be an opportunity to train our Area and Division Directors and pave the path forward for a successful Toastmasters Year. We have all had and move through a fear of public speaking. We can help you. Our supportive members have created an environment of good humor and encouragement that will see you through to many successes. In this installment of our Power Meeting series, we focus on Speechcraft. Featured are two knowledgeable speakers sharing some tips and tricks they’ve learned along the way. Next, an audience participation portion so you can practice speaking skills with members who’ve been where you are. Finally, an evaluation portion where our key-note speakers receive feedback both helpful to them, beneficial to the audience and developing for the evaluators. Visit https://www.cctmportland.us/PowerMeetingOnSpeechcraft.html for more information. This event is for Area and Division Directors to attend for makeup training to help our clubs and members thrive. See you there! Did you miss the Club Officer Training at TLI in June? Do you want to help your club achieve the goal of four or more officers trained in the June-August training period? The Toast of Old Town Toastmasters Club in Area 74 and Downtown Division “F” is hosting this opportunity to attend a make-up session. Open to all Toastmasters club members! This is an event for Area and Division Directors to attend for makeup training. This is the opportunity for Area and Division Directors to be trained to help our members thrive. Emilie Taylor our Program Quality Director and Cate Arnold our Club Growth Director will facilitate the training. What: This is a potluck. Bring your favorite dish to share. Also bring a Toastmasters anecdote, tip, or question to share in a Table Topics fashion. Here is your chance to bond with your fellow Toastmasters and be trained on club officer roles. You do not need to be an office to attend. We look forward to seeing you there! Come attend the Bend Toastmasters Leadership institute where you get the opportunity to learn how to thrive in your officer roles and help others succeed in theirs. This is an opportunity for makeup Directors Training for our Southern Division Directors and any from further north that would like to take the beautiful drive south. Officers’ Training (TLI Makeup) — Open to all club members interested in Leadership. Bring a snack or treat to share (optional). Other Areas are welcome to attend. 1. Explore the qualities, values and styles used by effective leaders. 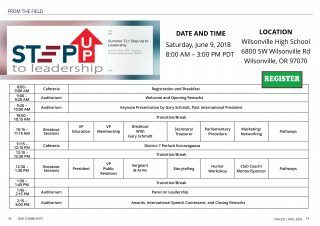 This Toastmasters material will be presented in 3 parts by 3 different presenters each of whom has diverse leadership backgrounds and experiences. Participants will be challenged to develop their leadership skills to help to motivate their club(s) to meet or exceed club goals and expectations in the coming year. Attention Toastmasters of Division C (Salem, Silverton, Woodburn, McMinnville, Newberg, Sherwood, Willamina, Sheridan, Lincoln City)! If you are an incoming club officer for the 2018-2019 Toastmaster year and you missed TLI on June 9th then here is your opportunity to get trained! We will meet at the Chemeketa campus in Salem, Building 8, Room 218 (2nd floor). We will have fellowship, fun, and some light snacks. Looking forward to seeing you there! Did you know that if you get your officers trained, your dues paid on time & your officer list submitted on time for the following year, you would only need 1 more award to be a Distinguished club? You do now! And we have the perfect way to help you on your Distinguished Club Journey: Make Up Officer Trainings! All you need is 4 Officers Trained and you will be on your way to being a Distinguished Club! Additionally, if you get 7 Officers Trained, you will get the Super 7 Award, an award to recognize your club’s achievement in getting all 7 officers trained. This award will give your club a Super 7 Award Ribbon to put on your banner AND enter your club into a drawing for a $50 Toastmasters International Gift Card that can be used to purchase additional supplies. Join us on Monday, August 13th at 6:00pm for the first of two Division H Make Up Officer Trainings. This will be a potluck, so please bring a drink, dish or treat. Officer Makeup Training is scheduled for Monday, August 13th at 7:30 pm at the Old Mill, 1650 SW 45th Pl, Corvallis, OR 97333. Training is expected to last for 1 hour. This training is the makeup training that was conducted in Portland in June. Any club member is also welcome to attend. Many members who were not able to attend this year’s TLI in the Portland area are asking about makeup officer training. For our members to thrive, training the club officers and members will deliver the most impact. Luckily, we have a Eugene area makeup session for you! Hosted by the amazing storyteller club over at Gateway ToastMasters, we will be having it at 7pm on August 22nd, 2018. Please let your clubs know, and encourage anyone who is interested in growing as both a Toastmaster and as a Leader to attend. I look forward to seeing you all there! Join us on Monday, August 27th at 6:00pm for the second of two Division H Make Up Officer Trainings. Come join the Portland Toastmasters Club (Club 31) as they hold their annual Humorous Speech and Table Topics Contest. The contest itself will start at 6:30, so if you’re coming to judge or help in any other way, please arrive by 6:00.